Why SureSmile® will have you smiling even before your braces come off! You’re getting braces. And while you’re excited about having that great smile, you may be nervous about wearing the wires and brackets. Well, there is a new orthodontic system that makes straightening your teeth with braces a lot faster and easier compared to conventional orthodontic treatment. It’s called SureSmile and it’s changing the way people feel about their braces. Our technology-driven orthodontic process offers several important benefits that make the whole “braces experience” much easier for patients than conventional orthodontics! You’ve probably heard from friends or family members that wearing braces is a long-term commitment, taking two years on average. While that may be true of traditional orthodontic treatments, it’s not true for SureSmile. Through the use of SureSmile’s sophisticated 3-D imaging, treatment planning, and customized precision arch wires, your orthodontist can reduce treatment time compared to that of conventional braces. In addition to shortening treatment times, the greater efficiency of the SureSmile system also helps reduce the number of wire changes and adjustments you’ll need, and that means fewer trips to the orthodontist. 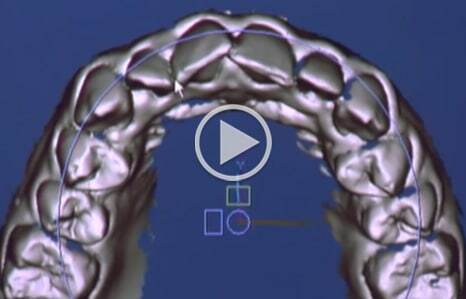 The SureSmile system’s 3-D software lets your orthodontist analyze how to effectively and efficiently align your teeth. Through this software, personalized arch wires are designed to move your teeth into proper alignment smoothly and directly, reducing the number of maintenance visits. Anyone who has worn braces will probably tell you that wire adjustments and changes were the least favorite part of the process because they usually caused discomfort. Fortunately, the SureSmile system is engineered to maximize therapeutic efficiency of each wire, significantly reducing the number of adjustments needed. This means fewer episodes of discomfort over the course of your treatment.